Lentil is a plant that in the old ways was used as a necessary part of the New Year and Christmas food, because it was believed that it brings good luck and money throughout the year. Many call it the lens, and the name in Latin is Lensculinaris. This food should be consumed more often, because it will certainly bring a fortune to your health. It is grown in more varieties that differ in colour, as yellow, brown, red, green and black. Modern life unfortunately, pushed this plant out of the menu of modern man. However, due to its rich nutritional value, primarily because of proteins it has lately been slowly returning. Surely you will be pleasantly surprised and will use the lentil in the diet, especially when you find out what its medicinal properties are, as well as the ways in which you can prepare it as a meal. It is believed that this remarkable plant was originally cultivated in Asia, since there are many dishes with lentil in that cuisine. Gradually, it spread through Europe and Africa, and later the American continent after the migration of people. Today it is one of the main commercial and export products of India, Turkey, Canada and China. Since it is a legume, this plant creates pods each containing one or two grains. They are usually round, but as we said there are several colours, of which the most common are green, black and red. All of them have a common composition and nutritional value, and if you want to know lentil contains small number of calories. You will be delighted by the fact that one teaspoon contains only 14 calories, which is really negligible, and this food is ideal if you are planning a diet. Also, a very important information that will benefit all people who care about their line is that these grains are rich in easily digestible fibre, which have beneficial effects on digestion and give a feeling of satiety. In addition, red lentils contain large amounts of copper, phosphorus and manganese, and next to them is a significant degree of iron, zinc and potassium. In addition to being abundant in proteins, each grain is a small therapeutic dose of vitamins B1 and B6. Since you are familiar with the basic facts, you will surely be of interested in the healing properties of the lentil. The high nutritional value of the beans is actually an indication that this is a healthy food that will be helpful when it comes to prevention, and treatment of many common diseases today. How good lentil is for health tells the fact that it lowers blood cholesterol levels. Thanks to this, it also helps in eliminating the risk of heart disease, and stroke, and your arteries will be healthy, elastic and protected from narrowing. Since ancient times it is known that those who eat high-fibre foods have very little chance of developing cardiovascular disease. 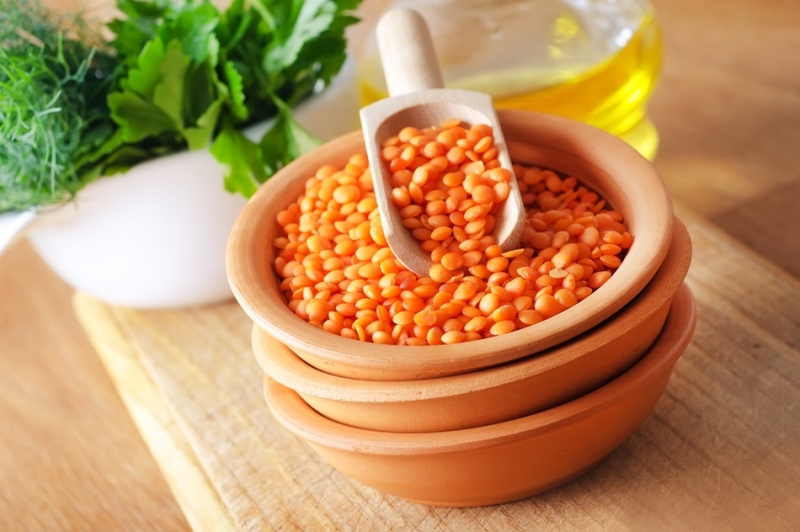 Since the lentil is one of the best allies in the fight against diseases that can harm this vital organ, it is recommended that you eat it as much as possible. Magnesium from these beans will help you to improve blood circulation, and blood itself will be richer in oxygen. Since you already know that it contains calories in very small quantities, and that it has a large amount of fibre, we can say that the red lens is one of the best dietary foods. It will help you lose weight, will give you a feeling of satiety and provide better digestion. Together with that it will eliminate any risk of getting irritable bowel syndrome, and you will successfully get rid of the problems with constipation. It should be consumed regularly, the fibres which are suitable for digestion will help your intestines, as well as your body to better transport carbohydrates. Consequently, lentil for diabetics is a great choice, because it stabilizes blood sugar levels, so it is recommended to persons who have insulin resistance and hypoglycaemia. Because it is rich in iron, it is the right choice when it comes to the fight against anaemia. Red grains of these plants are especially recommended for children who are most susceptible to this health problem, as well as for women during the menstrual cycle. In these cases, it is best to prepare lentil soup that will give the body the necessary amount of iron. Since it is a plant from whose grains many various dishes have been prepared, various countries have different styles of preparation. It is interesting that in Greece, they love to eat it instead of beans. Therefore, you can always try to replace these two and see for yourself how this is interesting, tasty and healthy food. The nations in Asia like to eat it, because there is no strong flavour. Since it easily absorbs flavours from spices, it is used a lot in India, where it is combined with rice. It is popular among vegetarians, who like to use it instead of soybeans, so out of it they make healthy and tasty burgers. The general rule when it comes to the way they are stored is that prior to cooking it should be immersed in water overnight and left to stand until the morning. This is recommended to avoid bloating, because like beans it contains a membrane that needs to be softened to avoid the appearance of gases. Depending on what dish you want to prepare, these grains are cooked differently. So, if you opt for the soup then they need to spend about half an hour in boiling water, and if your choice is a salad, then the 15 minutes will be enough. The following are three great recipes, in which the lentil is prepared in different ways, but each of them is very interesting and we believe that you will like them. How to prepare lentil stew? First, take lentil and wash it well, then boil for about ten minutes in plenty of water. Then, as with beans, discard this water. Next, finely chop the onion and fry it in oil. Add the sliced ​​carrot and then insert the lens to fry for about a minute while stirring. Add salt, pepper and paprika to taste. If you like spicy soup, you can add hot peppers. Fry for about 5 minutes, then add the tomato juice and a little less than 1 litre of water. Leave the lid on to cook over medium heat for about half an hour, or until you notice that the lentil is cooked. You can eventually add a little apple cider vinegar, but when serving the stew we recommend sour milk or sour cream. As with the previous dish, it is necessary to wash the grains well, then cover with water and let it sit for an hour. During this time, take the onion and finely chop it. Heat the oil and place the onion in it and fry until golden brown. Next, insert the red pepper, chopped carrots and stir. Drain the lentil and insert it together with oat flakes, and pour over with two cups of water. Fry three peppers in a pan or on the stove and put them in a saucepan. Cook 20 minutes, add water, if necessary. Just before the end, add chopped garlic, pepper, ginger, salt and parsley and leave it for a few minutes to cook. If you prefer thicker stew, reduce the amount of water. Wash the lentil and place in a lot of water to boil for about 20 minutes. During this time, grate cheese and a flask, chop the onion into small cubes. When you finish cooking lentil strain it and put it in a deep pan to cool. Add all the ingredients and mix well, then add the egg, olive oil, bread crumbs, parsley and season as you like using salt, pepper and cream. Mix well to create equal mass, then with wet hands form meatballs and roll them in cornmeal and bread crumbs. Heat the oil in a pan and fry them until golden brown. Then take them out and drain them. The mentioned amount is sufficient for 24 meatballs. Where to buy the lentil and that is the price? If you like lentil meals that we have suggested, you must be interested in buying these nutritious and healthy foods and their price is about 2 dollars for a pack of 200 grams. Of course, it is always possible to buy the amount that best suits you and in this case the price is slightly lower. In addition to the major markets, red lentils, as well as any other can be bought in health food stores, but in recent years are also available for purchase via the Internet. The lentil in the diet has been around since the Stone Age, it reduces the risk of colon cancer because insoluble fibres stimulate digestion and reduce the retention time of foods in the digestive tract. It is also rich in vitamin B, as well as a large amount of carbohydrates, and represents a great piece of food. Due to its complex composition and plant fibres it contains, carbohydrates after a meal gradually go into the bloodstream. It prevents attacks of hypoglycaemia, provides the feeling of satiety and energy. Does it cause some side effects? Excessive use of lentil can have some bad effects, but the most common is the feeling of bloated stomach. Adverse events can appear in the form of problems in the kidneys, as well as an increased level of potassium in the body. Please note that the lentil in the diet is not recommended for people who exhibit allergic reactions to legumes and plants, such as beans and peanuts.